As world leaders gather in Katowice, Poland for the 24th Conference of the Parties to the United Nations Framework Convention on Climate Change (COP24), signs are evident that several long-time influential players are abdicating leadership on the issue of climate change. The United States has said it would withdraw from the Paris Agreement, Australia is not slated to meet its emissions targets, and Brazil recently announced it would not host next year’s COP25 summit as planned. However, China has apparently moved in the opposite direction, stepping into this leadership gap and championing a concept over the past several years that it calls “ecological civilization”. This concept not only has the potential to impact the global climate agenda, but may shape energy markets and strengthen Beijing’s broader geostrategic positioning. What does ‘ecological civilization’ mean? Ecological civilization refers to the aim of achieving harmony between people and nature. The move to make environmental issues a “social value” (so termed in 2015 by the Central Committee of the Communist Party of China) came in response to growing pollution-related challenges in China, which are largely a by-product of industrialization and fast economic expansion. In 2007, the year the ecological civilization concept was first introduced on the political level, just 1% of urban residents in China breathed air that the European Union regarded as safe, and 500 million lacked access to safe drinking water. As a result, the government faced the need to balance its desire for rapid growth, first championed under Deng Xiaoping, with the reality that growth at any cost could create social unrest, given the toll that pollution was taking on its citizens’ health. Ecological civilization aimed to achieve the country’s economic and environmental interests by framing them not as in competition, but as in harmony. For instance, the lexicon of ecological civilization in China includes frequently used phrases that describe environmental protection in terms of economic value, such as “green is gold” and “lucid waters and lush mountains are invaluable assets”. China’s ecological civilization policies, not surprisingly, have the potential to shape markets. For instance, the country’s “National Sword” campaign in January 2018 banned the import of 24 types of solid waste, including most types of plastics. This was notable, since China imported two thirds of the world’s exported plastic waste in 2016. The campaign aims to improve environmental conditions by cutting out a significant amount of high-polluting, low-end recycling. But it has also disrupted global recycling markets and forced developed economies to rethink their consumption and recycling systems fast. Similarly, China’s investment in renewables has the potential to create lasting impact in the energy sector. China ranked as the leader for renewable energy investment in 2017, accounting for close to half of the global total. Five of the world’s six largest solar-module manufacturers are Chinese, as are five of the largest wind turbine manufacturers. While Chinese investment in renewables was up 58% in 2017 from the previous year, investment in the US dropped by 6% and in Europe by 36%. China has also become a major source of foreign direct investment, investing $44 billion in renewable energy as part of its Belt and Road Initiative. China’s electrification of the transport sector could also shape global energy markets and may shape its geopolitical priorities. 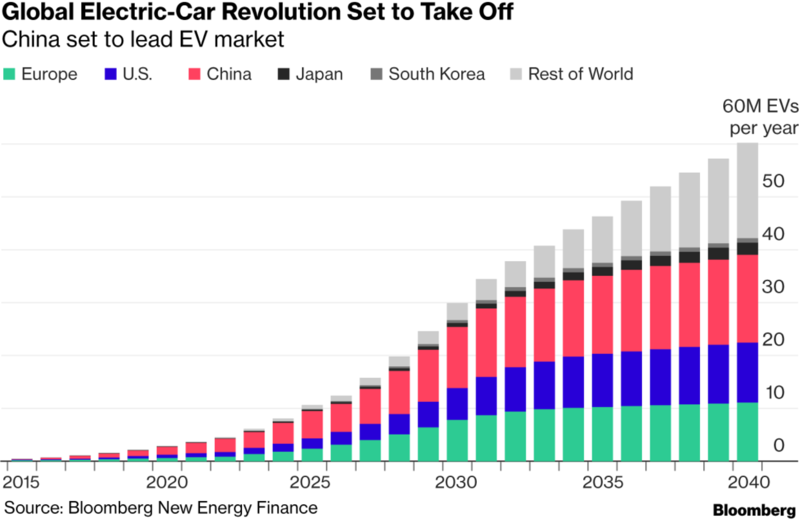 China is taking a lead in the production of electric vehicles; by 2021, China will be expected to produce 70% of the world’s electric vehicle batteries. As well as helping cut pollution, the investment in electric vehicles comes as China currently consumes 11.5 million barrels a day (mbd) of oil, only 4 mbd of which are produced domestically. Because 80% of its imports pass through the narrow Malacca Strait, China has historically seen this as a strategic weakness, sometimes known as the “Malacca Dilemma”. While China's drive for electric vehicles could help minimize this strategic vulnerability, it could open new challenges. For example, the Democratic Republic of the Congo produces 58% of the world’s cobalt - a vital component of vehicle batteries. The transformations taking place could give way to a new geopolitical map for energy. China has long understood the value of soft power. It has spent the last decade promoting Chinese language through a network of Confucius institutes and building an international media network that generates news with a China-positive message. The efficacy of this campaign has been questionable, but perhaps global leadership on the environment can provide China with the international soft power for which it strives. China’s embrace of ecological civilization policies positions the country as a leader in the climate space. There was a marked shift in China’s position on international climate negotiations between the failed 2009 Copenhagen climate summit and the successful 2015 Paris summit. China moved from being sceptical about the need for an international framework to address climate change (having been accused by some of sinking the 2009 negotiations), to defending the multilateral approach. At the 2017 World Economic Forum’s Annual Meeting in Davos, President Xi stated: “The Paris Agreement is a hard-won achievement … All signatories should stick to it instead of walking away from it, as this is a responsibility we must assume for future generations”. Could a Digital Silk Road solve the Belt and Road's sustainability problem? But China’s leadership in the climate space could also have broader implications. Positioning itself as an effective climate leader would allow China, in visible contrast to the US, to wear a white hat on what is arguably one of today’s most important global challenges. Environmental preservation can be a “value” for China to uphold, and any successes in delivering on it can legitimize Beijing’s governance practices. If China’s centralized system of government proves better equipped to address it than a fractured liberal democracy (such as the US), then it could be harder for the global community to be critical of China’s system of governance. Can ecological civilization achieve China’s objectives? China is in a challenging position. While it has lifted 850 million of its citizens out of extreme poverty over 35 years, its GDP per capita of just under $9,000 is not close to that of advanced economies. Economic growth is a paramount priority for Beijing, given its goal to be a more powerful country by 2050. At the same time, despite its focus on improving the environment, China remains the world’s leading carbon dioxide emitter, and air pollution contributes to more than 1.5 million deaths every year. The question remains as to whether China’s ecological civilization policies will enable the country to continue to achieve strong growth in a way that reduces damage to the environment. But as this question is being answered, China, by virtue of taking the mantle of sustainability, may nonetheless be able to reap geopolitical reward.